Stroke comes in as the fourth leading cause of death, only behind cancer, pneumonia and ischaemic heart diseases. It accounts for 10%-12% of deaths and is also the largest cause of long-term disability in Singapore. Stroke occurs when blood flow to the brain is interrupted and this can be attributed to two causes: blockage of blood flow to the brain or when an artery to the brain is ruptured. Without treatment, the blood-deprived brain cells die, which may result in brain injuries, disability or even death. The most common type of stroke, ischaemic strokes, occur when the arteries to the brain become narrowed or blocked, reducing blood flow. 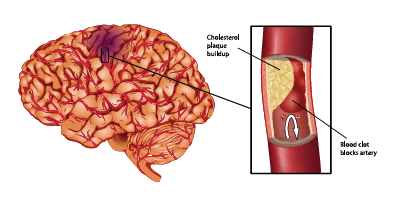 This occurs when a blood clot forms in the arteries that supply blood to the brain, usually caused by fatty deposits or plaque that build up in arteries (atherosclerosis), leading to reduced blood flow or other artery conditions. This occurs when a blood clot or other debris forms in other parts of the body - usually in the heart – and is carried by the bloodstream to the smaller, narrower brain arteries. Arteries become blocked or narrowed as clots become lodged in the vessels. “During a stroke, 32,000 brain cells die per second (1.9 million per minute). Damage can be minimised with timely treatment." Haemorrhagic stroke is caused by ruptures in blood vessels, which may be a result of conditions related to the vessels such as high blood pressure, hardening of artery walls and weak spots in the vessel walls. This happens when a blood vessel bursts in the brain, spilling into the surrounding tissues, damaging brain cells. When an artery on or near the surface of your brain bursts and spills over to the space between the surface of the brain and the skull, it is known as a subarachnoid haemorrhage, often signalled by a sudden, severe headache. After the haemorrhage, the blood vessels in the brain may widen and narrow erratically, and brain cells suffer damage due to further limits on blood flow. Also known as a mini stroke, TIA occurs when clots or debris block blood flow to the brain. However, the blockage is temporary and symptoms usually subside when blood flow is back to normal. TIAs usually last less than five minutes, and many people may dismiss the symptoms, failing to realise that they have suffered a mini stroke as it is impossible to identify TIA based on the symptoms. The safest way is to seek emergency care even after the symptoms seem to clear up, as TIA puts one at greater risk of a full-blown stroke. A TIA serves as a warning, indicating that one is likely to have a partially blocked or narrowed artery leading to the brain or a clot source in the heart. 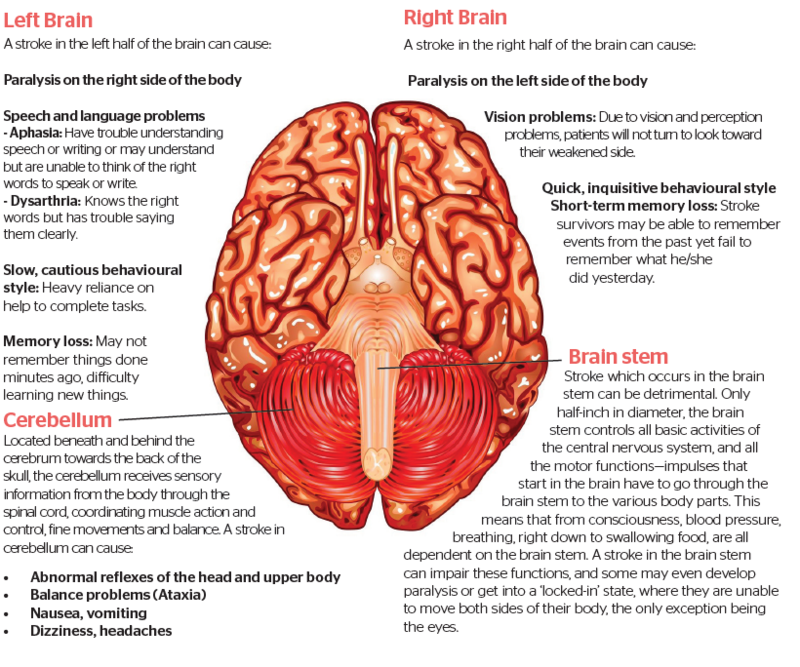 Each side of your brain controls the opposite side of your body, which explains why there are neurological complications on the affected side when a stroke takes place. In other words, a stroke on the left brain will affect the right side of the body and vice versa. The effects of stroke are determined by several factors, such as the location and severity of the stroke and one's health status.